We are starting a series about our favorite royal events, and we detail why they are our favorites and important to us. If you know me and have followed my social media and work with Royal Central, you’ll know I’m an ALS (MND if you are in the UK) advocate after losing my mother to teh disease in 2016. Naturally, my favorite royal event relates exactly to that. Back when she was still Princess Maxima, the current Queen of the Netherlands swam in the murky Amsterdam canals (which have not officially been designated as safe to swim in) in the Amsterdam City Swim in benefit of ALS on September 9, 2012. She would finish the course in under an hour. I actually wrote about this event in a Flashback Friday piece for Royal Central, which you can read here. During her swim, she had a cheering section consisting of then Prince Willem-Alexander, Prince of Orange and their three daughters: Princess Amalia, Princess Alexia and Princess Ariane. Although Maxima participated years before my mother was diagnosed and passed away from ALS, it meant so much to find out about this event in late 2016. ALS is a disease that does not get enough attention in regard to awareness and funding for research. So to see someone like Maxima, who has such a powerful influence across the globe, participate meant the world to me - and I’m sure to so many other people related to ALS (whether that be having the disease, being a caretaker of someone with the disease, or just a friend/family member of someone with ALS). There are several royals who are taking part in the fight against ALS in various ways. But Maxima’s participation in the Amsterdam City Swim was one of action, and I can’t tell you how much I respect her for that. We are taking a look at our favorite Queen Maxima outfits. We also have a special guest giving her opinions, Josine Droogendijk, who runs the blog modekoninginmaxima.nl. Make sure to check out her site! Hands down, my all-time favorite look of hers was the gorgeous royal blue gown by Jan Taminiau. I loved how there was lace at the top and a cape draped over her shoulders. To top it off, she wore the perfect tiara (Dutch Sapphire Tiara) featuring blue sapphires. Maxima looked STUNNING that day! I also like the red Valentino flowy gown she wore a dinner in honor of the German President Joachim Gauck and his partner, Daniela Schadt in February 2017 at Noordeinde Palace. Another favorite of mine is her tan (and bright green paint splattered look around the middle) A-line midi dress by Mattijs van Bergen that she wore during an official tour in Perth, Australia, in November 2016. My last choice is the light orange one-shoulder gown by Jan Taminiau that she wore to the celebrations of her 40th birthday in May 2011 while she was still a Princess. I loved the look and color on her and that it also had a cape feel on the one shoulder. My first choice is the Jan Taminiau gown she wore to Prinsjesdag 2015. It's such a beautiful and it looked stunning on Maxima! 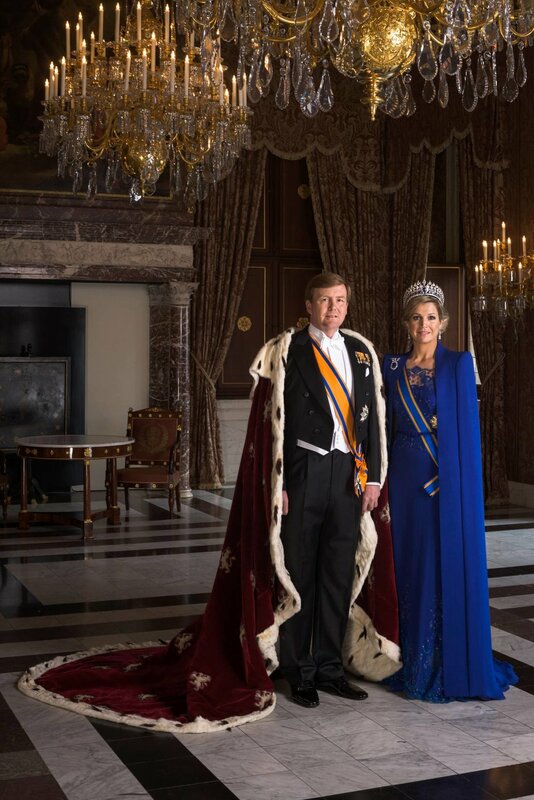 She recently wore it again in the official photos celebrating King Willem-Alexander's 5 years on the throne. Another one of my favorite is the Jan Taminiau one sleeve red gown she wore during their official visit to Italy last year . I'm a huge fan of Jan Taminiau's work and I believe Maxima always looks stunning in his gowns. This one is no exception. Next, I chose the Valentino black gown she wore in 2016 to the gala dinner for Queen Margrethe's birthday. It's not as original as some of Maxima's gown but it's also very Maxima with the fringes. Finally, I chose another Jan Taminiau gown, this time the gold one she wore to Prinsjesdag in 2013. Again, she looks stunning and I love the combinaison with the hat. My first choice is the yellow/orange Natan dress from the wedding in Monaco in July 2011. Secondly, I like the purple dress from Jan Taminiau. She wore the dress on April 28, 2017, on the 50th birthday of her husband. Next, I chose the ensemble from Prinsjesdag 2016 from Claes Iversen. 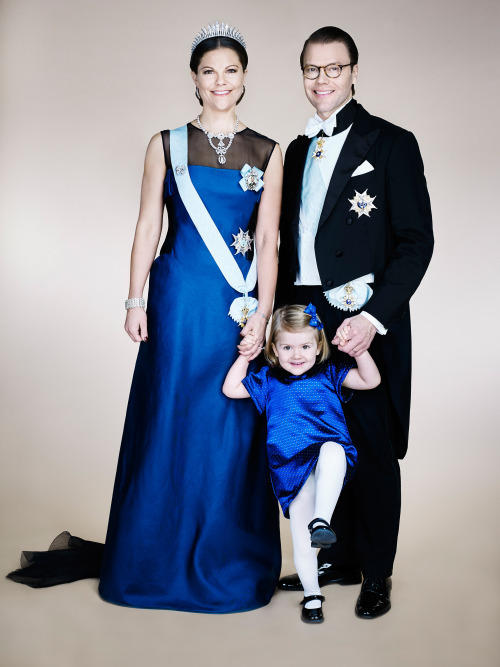 My last choice is the Jan Taminiau gown from Carl Philip and Sofia's 2015 wedding. I like the blue Jan Taminiau gown from the inauguration. This was just an iconic look from such an important day. It was the perfect gown to showcase the beautiful and grand sapphire tiara. And that cape had me swooning. Another favorite is the red Jan Taminiau gown from the evening of the inauguration/Sofia and Carl Philip's wedding. Again, it's a stately gown that was perfect for the occasion. It's also a fantastic backdrop to the beautiful ruby tiara at Sofia and Carl Philip's wedding. My third choice is the purple Roksanda dress from May 2017 in The Hague at an event with Qatar's Sheikha Mozah at the seminar on Protection and Education In Conflict Zones. It's the dramatic sleeves Maxima loves done by a designer who loves dramatic sleeves and in a stunning color. It just fits Maxima's personality so well. And finally this floral Natan for a 2017 conference in Germany alongside Ivanka Trump. She also recently wore it to welcome the Mexican President and his wife to The Netherlands. This is a dramatic and fun dress that fits Maxima's personality but isn't too much. I love how the floral is deployed. It's a dress that just makes me smile. About my choices: Personally, they’re all very calm and well put together compared to a majority of her outfits that are “out there” or unusual. I love her in outfits that make her look professional and beautiful. One of my favorite outfits of hers was the green dress by one of her favorite designers, Natan. This was from the trip to Japan in October 2014. The burgundy accessories matched really well, too. My next choice is the multi-colored striped dress/gown that she wore to the King's Day concert earlier this month. It was designed by Mary Katrantzou Duritz. The Queen was also in Natan pumps and clutch. Like Laura, I like the floral Natan from a 2017 conference in Germany. She's repeated it since, and I love that it is getting more wear! My last choice is the Jan Taminiau navy and burnt orange coat and dress that she wore while in Beijing, China, in February 2018. I also really like the royal blue gown by Jan Taminiau from King Willem-Alexander's inauguration as King of the Netherlands back in 2013. Another favorite of mine is the blue floral gown by Luisa Beccaria she wore in September 2016 to the gala dinner for the Princess Maxima Center for Oncology in Amsterdam. Another favorite of mine was her light pink Jan Taminiau gown with the light purple satin cape from her brother's wedding in June 2014 in Vienna. I love it so much! I had so much trouble deciding that I had to call in reinforcements. My roommate helped me decide on the last one and this one. I love her green Jan Taminiau gown from the October 2017 state visit from Portugal. For a rainy Prinsjesdag on September 15, 2015, Queen Máxima and Princess Laurentien wore Jan Taminiau and Missoni gowns, respectively. The Queen's short-sleeved gown was a very pale pink with floral beaded details in burgundy that were hand embroidered. She also wore a pair of matching burgundy gloves with the ensemble. True to her vibrant personality, Máxima was wearing a pair of matching burgundy beaded drop earrings; sadly, these earrings are still UFO. Queen Máxima's floral headpiece was also by Jan Taminiau and matched her gown perfectly. Princess Laurentien's cream hat was by Eudia. Laurentien's green long-sleeved gown featured a cape and a chevron design from top to bottom. Of course, the orange Order of the Gold Lion of the House of Nassau stood out against the green (which actually found more flattering together than I would have thought). Prinsjesdag (also referred to as Prince's Day in English) is an annual holiday in the Netherlands where the Dutch monarch addresses a joint session of the Senate and House of Representatives for a speech from the throne. It takes place in the afternoon at the Ridderzaal. In 2018, it will take place on September 18. After the King addresses the joint session, he, the Queen and his brother, Prince Constantijn and sister-in-law Princess Laurentien appear on the balcony of The Noordeinde Palace to wave to well-wishers who have gathered below. On October 12, 2016, Queen Maxima was in her native Argentina as part of her role as the UN Secretary-General's Special Advocate for Inclusive Finance. She had several events on her agenda while there including meeting the President of Argentina, Mauricio Macri, at Casa Rosada. Additionally, she returned to her alma mater, The Pontifical Catholic University of Argentina. Her parents were in the audience for this appearance. For her meeting with President Macri (and Argentina Minister of Economy Alfonso Prat-Gay at a separate location), Maxima wore a red Natan blouse and a tartan Natan skirt with a Steltman bracelet and red Gianvito Rossi heels. Her matching red purse was also by Natan. When she returned to her alma mater to give an exclusive speech to the students regarding financial inclusion for development, the Queen wore a green animal print dress by Givenchy, Cartier watch, Steltman bracelet, a pair of large diamond stud earrings and Christian Louboutin black heels. She carried a black Chanel medium sized bag. For both days, some of her jewlery still stands as UFO. According to Royal Central, "They cited the World Bank Group’s statistics that only half of adult Argentinians have a savings account, and most monetary transactions are done through cash. Because of this and the lack of proper financial records, it is difficult for small businesses to be granted a loan to expand their businesses." Before returning to the Netherlands, she made sure to thank her home country for warmly welcoming her back in a press conference with Vice President Gabriela Michetti regarding her visit. When Maxima Zorreguieta wed the then Willem-Alexander, Prince of Orange on February 2, 2002, the soon-to-be Princess wore a custom Valentino creation. Their engagement had been announced by Queen Beatrix less than a year earlier on March 30, 2001. Maxima's Valentino gown had a cow neckline and was made of ivory mikado silk. It has three quarter sleeves and a 16.4 foot lace train; the skirt featured lace designs, as well, as slightly flared out. She wore the star version of the Pearl Button Tiara. According to the Court Jeweller, "Rather than wearing the tiara with the pearl buttons, Queen Máxima chose to wear it on her wedding day with five of the diamond stars that belonged to Queen Emma. Emma had been given two sets of diamond star brooches when she married King Willem III in 1879. One set has stars with ten points; the other has stars with twelve." Her bouquet included white roses, greens, lily of the valley, and gardenia. She wore a pair of diamond earrings that had belonged to Queen Wilhelmina. They were first wed in a civil ceremony at the Beurs van Berlage in Amsterdam before traveling to the Nieuwe Kerk for the religious ceremony. The bridesmaids were Valeria Delger, Juliana Guillermo, Theresa Baroness von der Recke, and Inés Zorreguieta all wearing two toned red gowns. The pageboys were Jonkheer Paulo Alting von Geusau, Johann-Casper Freiherr von dem Bussche-Haddenhausen, Alexandre Friling, and Floris ter Haar, while the flower girls were Countess Leonie zu Waldburg-Zeil-Hohenems and Princess Pauline zu Sayn-Wittgenstein-Hohenstein. The ceremony had a bit of sadness as Maxima's parents were not in attendance. Due to controversy relating to her father's time working in the Argentinian government during its last dictatorship. He argued he knew nothing of the Dirty War that had taken place while he was a cabinet minister. The Dutch government would not allow him to attend the ceremony, so Maxima's mother stayed behind in Argentina with her husband. During the ceremony, the Argentine tango "Adios Noniño" (Adieu little papa) was played, which resulted in tears from Maxima and her siblings. After the ceremony, the new Princess and her Prince walked out of the church under an arch of swords being held by Officers of the Royal Netherlands Navy. They were then taken through the streets in a horse drawn carriage before making a balcony appearance at the Royal Palace where they kissed before the crowd in Dam Square. The wedding saw 1,900 military personnel take part. Guests at the wedding included the Dutch Royal Family; Prince Charles; King Carl XVI Gustaf, Queen Silvia, Crown Princess Victoria, Prince Carl Philip and Princess Madeleine of Sweden; King Harlad, Queen Sonja, Princess Märtha Louise and Ari Behn, Crown Prince Haakon and Crown Princess Mette-Marit of Norway; King Albert, Queen Paola, Prince Philippe and Princess Mathilde of Belgium, Queen Margrethe and Crown Prince Frederik of Denmark; Hereditary Prince Alois and Hereditary Princess Sophie of Liechtenstein; and Queen Noor of Jordan. Celebrations began two days before the ceremonies with 500 guests being invited to a dinner and ball at the Royal Palace in Amsterdam. It was a joint celebration as it was also honoring Queen Beatrix's 64th birthday. The following day, February 1, 2002, 1600 guests were in attendance at a concert and luncheon at the Amsterdam concert hall, Concertgebouw. That evening an event was held at the Amsterdam Arena where 50,000 people attended the event organized by the National Orange Committee and the city of Amsterdam. For her husband, Willem-Alexander's investiture in Amsterdam as the King of the Netherlands on 30 April 2013, Queen Maxima wore a royal blue Jan Taminiau gown during the ceremony in the afternoon at the at the Nieuwe Kerk (New Church). It was conducted before the joint assembly of the States General. Maxima's gown featured lace detailing at the top with a matching cape with a train. The Queen wore her Order of Netherlands Lion sash and the full version of the sapphire and diamond Dutch Sapphire Tiara. About the tiara, Order of Splendor reported, "She made a change to the center top of the tiara, to lower the central element." All members of the Dutch Royal Family were in attendance as was many European and worldwide royals like Prince Albert of Monaco, Princess Lalla Salma of Morocco (wife to the King), Crown Prince Frederik and Crown Princess Mary of Denmark, the Prince and Princess of Asturias, Prince Charles and the Duchess of Cornwall, and Crown Prince Haakon and Crown Princess Mette-Marit of Norway. Maxima is also pictured in the same outfit in an official photo on the Royal House of the Netherland's website. Then-Queen Beatrix signed the instrument of abdication at the Moses Hall that morning after announcing her intent to abdicate in January of that year. Willem-Alexander was one of four new monarchs who took the throne in 2013. The others were King Philippe of the Belgians, Pope Francis, and Emir Tamim bin Hamad of Qatar. At the time, he was the youngest monarch in the world. He held that title until Felipe of Spain took the throne on June 19, 2014.